Ihhhht’s a summer bliss bowl! And it has an adorably tasty pile of sweet potato falafel on top! It’s the summer version of the winter bliss bowls and it’s basically the best thing my bowl-loving self could want in the month of August. Question. What are your feelings about sweet potato falafel? Excited? Mad? Happy? Confused? Already on your way to to the store for sweet potatoes? I’d say my feelings are mostly happy, and nostalgic (aww, remember those lentil falafels we did together last winter?) and a little scared because are the falafel police coming for me for my omission of chickpeas? I know I’m going off the beaten path a little bit here. but mostly, more than anything else, the feeling is just SUPES EXCITED to eat a big bowl of fresh, end-of-summer vegetables loaded with that creamy, perfectly tangy, and just a little bit spicy jalapeño ranch. Yeah, no. I know it. We didn’t even talk about the ranch yet. ♡ Obsessed doesn’t even touch it right now. Okay, let’s have a few words about falafel. I don’t claim this to be an authentic falafel. I DO claim this to be a delicious, real food, no-bean (!!! ), quick and easy alternative to making traditional falafel from scratch. Guys. It’s SO EASY! It brings my heart so much joy to put easy, real food, actually-will-make-them-in-real-life recipes like this on this blog. I’m not saying it won’t take you a long time to chop up all your veggies and make a dressing from scratch and fry your falafels. Be reasonable with yourself. These things take time. If you need a way to pass the time more enjoyably, I recommend pouring the last of the rosé and putting on a good podcast on (s/o to all my nerds in the house) and deciding for yourself if this whole BLISS BOWL phenom is more about epic taste or more about the semi-relaxing fitspo routine of intentionally and thoughtfully preparing everything. I dunno, tie. But if I can brag these guys up, the falafel specifically? I literally can’t stress how easy these are compared to any other made-from-scratch falafel. We’re talking 5 ingredients, 5 minute prep, ready for your bliss bowl and your mouth in such a short amount of time. If the whole process of bliss bowl prep is going to take you a while, you might as well at least get some quick and easy falafel done so you can dip it in jalapeño ranch and munch on it while you chop the veggies, rite tho? Summer! Sweet summer, summer, summer. 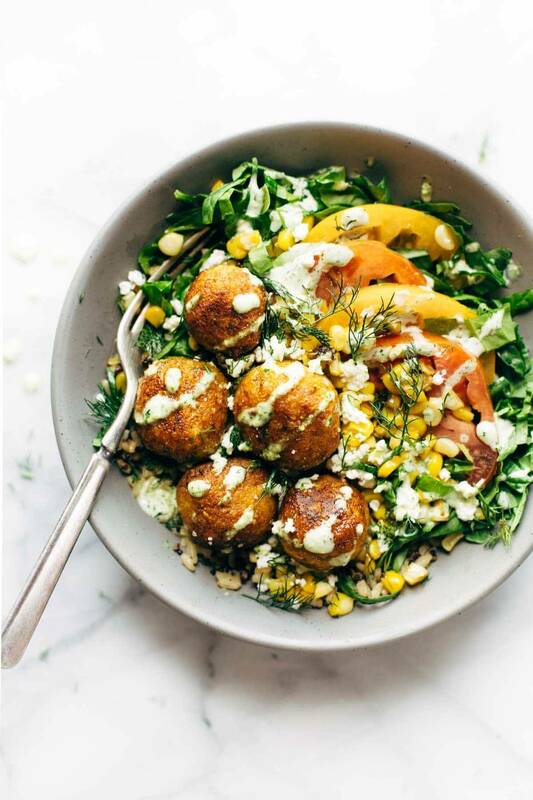 Heirloom tomatoes, dill, creamy jalapeno ranch, fresh spinach, roasty corn, goat cheese, and sweet potato falafel. 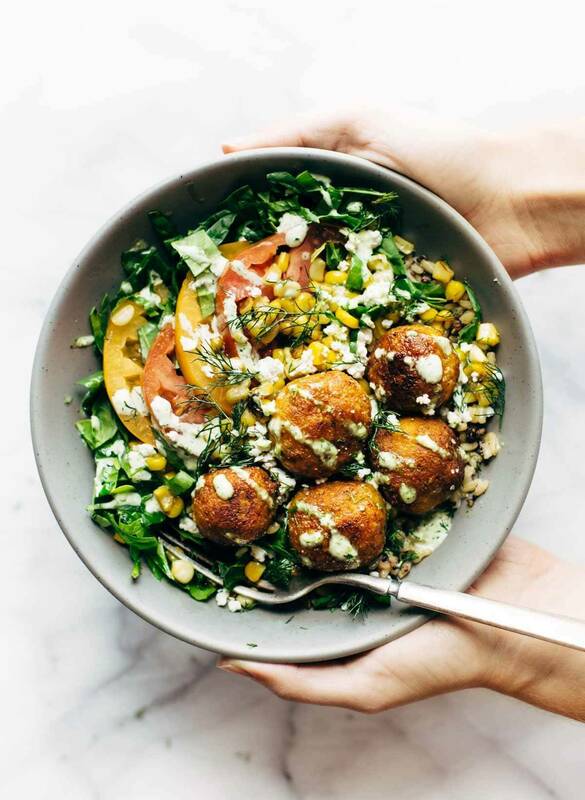 Summer Bliss Bowls with Sweet Potato Falafel and Jalapeño Ranch – you will not believe how easy this 5 ingredient falafel is! 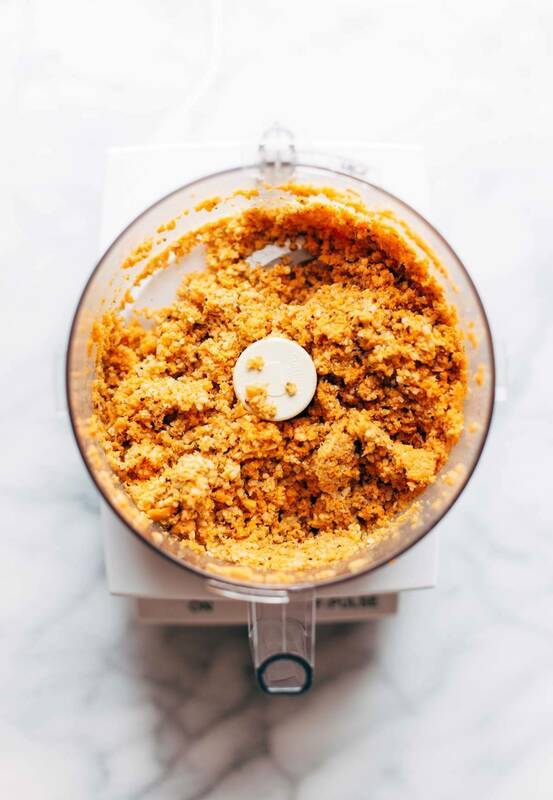 FALAFEL STEP ONE: Pulse the sweet potato through a food processor until finely minced. Add the brown rice/quinoa and almonds and pulse until well mixed and uniform in texture. Add the egg and salt and pulse until mixed. Transfer to a bowl and stir in the flour. FALAFEL STEP TWO: Form the mixture into balls or patties. Heat the oil over medium heat and fry each falafel for a few minutes on each side until golden brown and cooked through. BOWLS: Assemble all your ingredients in a bowl. Top with the falafels and jalapeño ranch dressing. Basic olive oil and lemon juice dressing works great, too, if you’re short on time. Nutrition information is for the falafel only. If you want to make true falafel, here’s a great recipe! kombucha! the perfect pair for a bliss bowl. do you think the falafel would keep well in fridge or freezer if made ahead for a week of lunches or a few dinners? thanks! Yes! It isn’t particularly crunchy, like a deep fried crunchy, so it actually saves pretty well. I’d maybe freeze it if it’s going to be more than a day or two. Good luck! Say whaaaaaat?? I’m completely sold. i recently made falafel using lentils and were delicious. not your traditional fried ones but gooood stuff. i am loving the idea of sweet potato version…i hate frying things at home so maybe i will give it a panfried version. Yeah! I didn’t try baking these ones, but I know the baked lentil falafels I did with the winter bowls were reeeeally good and really easy, too. good luck! I am absolutely drooling looking at this. I don’t care how long they take, I need this bowl in my life! Thanks Jen! hope you like em. Oh my!! I am on my way to the store right now to get some sweet potatoes… and some rose 😉 These look delicious!! 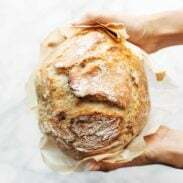 I’m loving this recipe and am curious what you think about flour substitutions. Have you tried any? If not what would you be inclined to try? What is the role of the flour in flalafel, is it to bind or something else? Thank you! This looks AH-MAY-ZING! Thank you!!!! To answer your question, I feel very VERY good about sweet potato falafel! I cannot wait to try these and maybe even combine them with real falafel and add some chickpeas. This is genius! I like that. I like that a lot. Good call Jess! Sweet potatoes?? AND falafel?? Two of my favorite foods? I’m sold!!! Plus the ranch and the rest of the bowl is calling me…I can’t even. Definitely making this for a dinner! THE RANCH. I literally want to put it on everything. This looks like a spectacular recipe. I will make it for dinner tonight. WOW! Thank you. Thanks Brenda, hope you like it! Oh yeah, making this tonight. Hope you like it Sandra Lea! Ermahgerd, can’t wait to try these! Summer bliss bowl, here I come! Might add some nectarines as well… aww yiss. oh yeas. You’re a boss. This is awesome! Definitely need to try it. Looks so delicious. Thanks Erikka! hope you like it! Now THAT is an innovation right there! Never would have thought to make sweet potato falafels! This is another winner of a bowl! These look so delightful, I’ll definitely be trying those sweet potato falafel soon! Thanks Rhian! Hope you like them. It looks ama amazing! I have a new cooking blog. Thanks for saying hi, Nunzia! It’s sort of backwards, would have been better timed for fall, but whatevs. 🙂 take it as it comes, right? Nah…there is never a wrong time to indulge in sweet potato. Down here in NZ we eat Kumara (our sweet potato) all year round…it’s basically a staple veg. Plus being on the flip side of the world means it’s all backwards to me anyways???? If the chickpea police come after you, just know that sweet potato lovers like me have your back! 😉 Looks stunning and delicious as usual! I’ve never tried making falafels but I love eating them! Do we need to cook the rice or quinoa before adding to the food processor? Lindsay, for the falafel…can you freeze them…as I’m going to make up a batch and cooking for one 🙂 Thank you!!!! Thanks Lindsey for sharing this delicious. What a fun spin on falafels! So creative!